New to the Random House list is author Bill Doyle with a tale of monsters, magic, and mayhem. After Keats and Henry lose their bikes, they need money-fast. So the help-wanted ad at the supermarket seems ideal for them. All they have to do is weed Hallway House's garden, find some lightbulbs in the attic, sweep the garage . 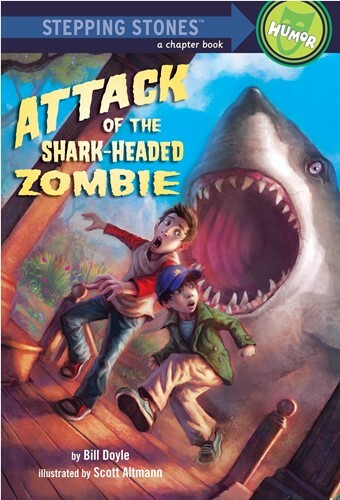 . . and battle a shark-headed zombie. But no one told them about the giant bookworms in the library, the toe-biting carpet in the halls, and the kitchen sinkhole! From the Trade Paperback edition.